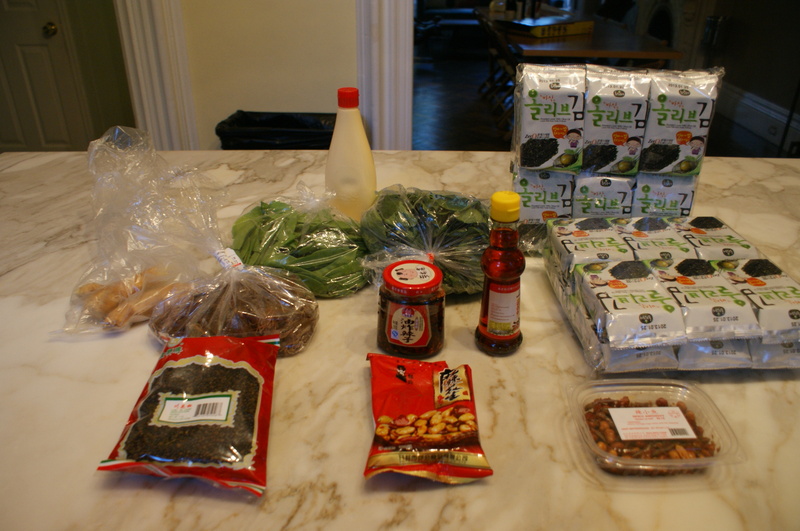 Last nights trip to the Chinatown Grocery Store yielded some fun items. We have some toasted seaweed packets for lunch, spicy peanuts and anchovies in one container, spicy sichuan peanuts in another container,Sichuan peppercorns, live shrimp,Chinese broccoli, pea shoots, kewpie mayo, various chile oils, ginger and off camera, a big bag of garlic peanuts. Total cost 36 dollars. 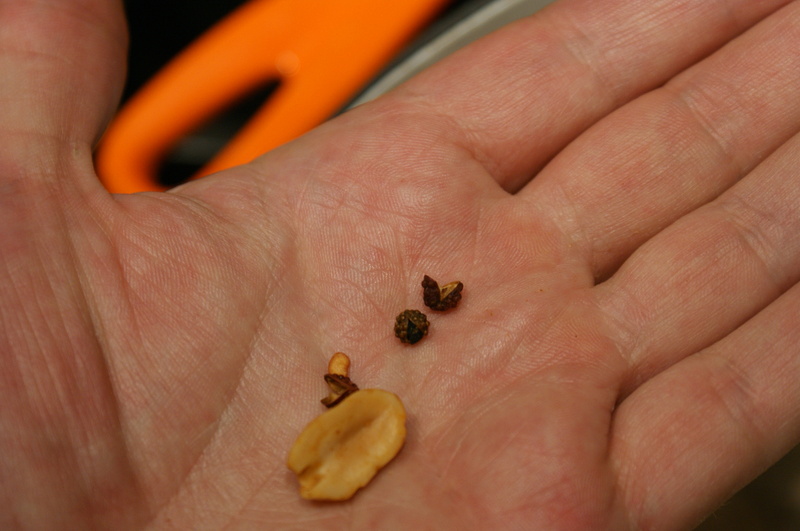 The bag of peanuts was loaded with sichuan peppers. If you are not familiar with Sichuan Peppercorns, they are very interesting. They have this floral taste to them, in addition to the taste they also have this numbing property. They Chinese have an expression, Ma La which means numbing and spicy. It also almost makes your mouth think things are slightly carbonated. It’s addictive, not literally but, it’s a very fun and interesting spice. Here this bag of spicy peanuts:there are plenty of the Sichuan Peppercorns. 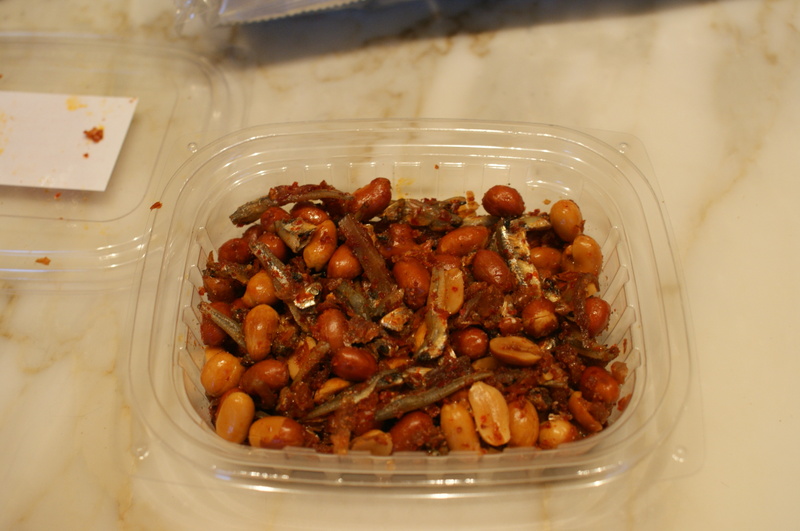 You have spicy peanuts, salty and slightly sweet anchovies, the only thing listen is a cold beer. These guys are the ultimate beer snack. I busted out the steamer. Steamed the broccoli, it works so well. Being able to lay them all one direction. I am officially in like with the steamer. Not just for making pastrami. 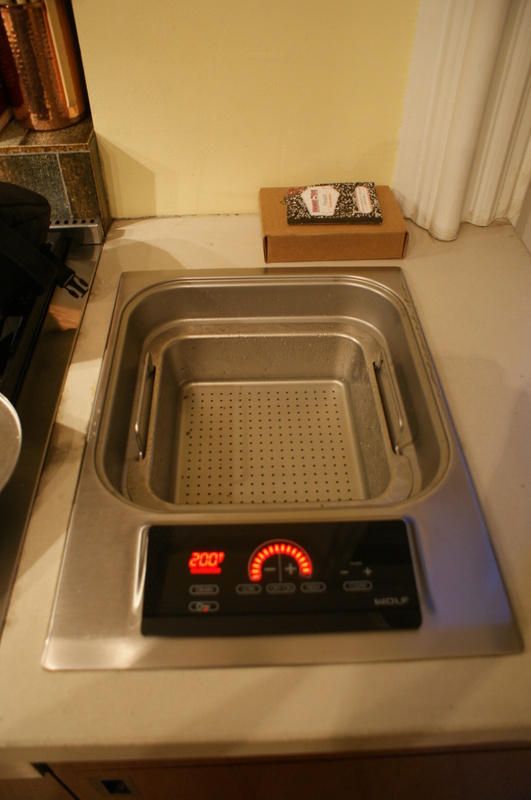 When we were designing our kitchen, a lot of thought went into installing the steamer. And after having this kitchen for almost 2 years, we finally starting using the steamer. The built in deep fryer needless to say has had many workouts. These shrimp were jumping out of the bowl moments before. To sesame oil, I added ginger and garlic, then cooking wine, then soy sauce and a little rice wine vinegar. 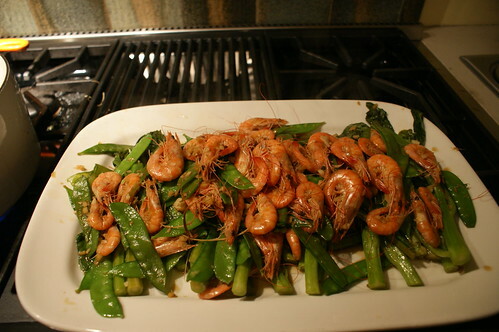 We sat around, split a bottle of wine and peeled and at the shrimp. They were so sweet and delicious. It’s hard to buy any other shrimp when you can readily purchase them alive. There is a huge difference in taste. I’m envious of your built in steamer and deep fryer. Since I’m in the south, you might think built in deep fryers are the norm here. Sadly, in my kitchen it is not. Oh! A built in rice cooker would be awesome too! Funny, rice is my one thing I have trouble cooking. A lambs head? Gnocchi, hand made ravioli and spaghetti all no problems. Even risotto! A simple plate of rice, something always goes wrong. It’s almost funny (except to those eating it) I don’t think I have the patience. Thanks for saying hello. I really like your blog. That’s so kind of you! Thank you. I had similar issues with rice, until I bought an awesome rice maker at Target. Here’s a link to the item I bought. It has special settings for white or brown rice. Oh, man. My Asian market doesn’t hold a candle to this. (though it’s good for flyover country…) Love the idea of built-ins for deep fryers and rice cookers; we’re all counter top around here! Thanks for liking my blog; I’ll be following yours as well! Thanks so much for your comment. Yes, we are very lucky to have such wonderful products at our disposal.